Exodus 40:29 And the altar of burnt-offering he set at the door of the tabernacle of the tent of meeting, and offered upon it the burnt-offering and the meal-offering; as the LORD commanded Moses. The rebuilding of the ancient temple is predicted throughout Scripture, starting with Daniel’s vision in Daniel 9:27. Jesus reiterated Daniel’s warning about an abomination standing in “the holy place” in the last days in Matthew 24:15, followed by the Apostle John’s vision of the Temple in Revelation 11:1-2. Paul mentioned it in 2 Thessalonians 2:3-4. Ascetic Jews have long wanted to resume sacrifices but without a temple, it was impossible. Now that the alter has been finished, sacrifices can be resumed after nearly 2000 years. But the place where they want to sacrifice is the third holiest site in Islam and carrying out the sacrifice of a goat there will inflame Muslims across the middle east. For that reason, sacrifices have been banned by the Israeli government. My guess is that the alter will be used — and soon — before the third temple is actually built. The Temple Institute in Jerusalem has announced that it has finished building an altar suitable for the Temple service. The altar, which took several years to build, can be operational at little more than a moment’s notice, reported Matzav Haruach magazine. The Temple Institute is committed to preparing all the necessary clothing and tools for the rebuilt Holy Temple in Jerusalem. In addition, the institute operates an educational center for visitors and a preparatory training program for members of the priestly family who wish to be ready to serve as soon as the Temple is rebuilt. The altar is a central component to the Biblical sacrificial service. In fact, there were separate altars for the incense and for other sacrifices. The larger altar sat in the outer courtyard of the Tabernacle, and later the Temple. It was approximately five meters (16 feet) tall and 16 meters (52.5 feet) wide, with four “horns”, or raised corners, and a ramp. According to the Bible, the altar may not be made out of stones hewn by metal implements. The altar prepared by the Temple Institute, under the direction of architect Rabbi Shmuel Balsam, follows this requirement. It is constructed instead from bricks fired at roughly 1,000 degrees Celsius (1,832 degrees Fahrenheit), to withstand the immense heat of the Temple’s eternal flame and the weight of the sacrificial animals. Its measurements conform to the interpretation of Maimonides. What makes the altar so unique is that it can be disassembled and reassembled easily, allowing it to be transported quickly and efficiently from its current location, on display at the institute, to the Temple Mount when the time comes. It was inaugurated in December 2014 and is now ready for use. 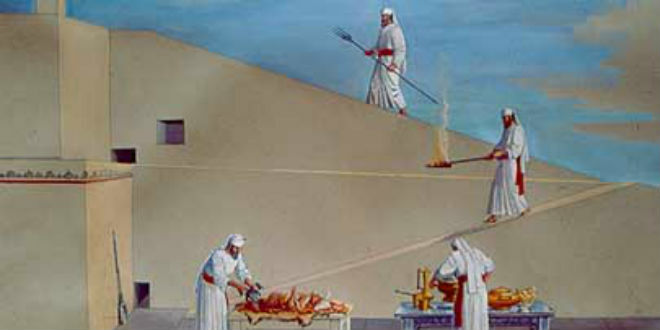 With Passover around the corner, and the Passover sacrifice a central component of the traditional celebration, perhaps that time will come soon! Now that the alter has been rebuilt, expect things to move even more quickly in the Middle East. Consider these “signs of the times” if you will. There are so many signs converging in September of this year, 2015; is God about to do something huge? Sign 1: We are in the middle of a “4-blood moons” sequence during which a blood moon falls on exact Jewish holy days. Two of the four blood moons have already occurred. The last two are in September and two weeks later in October of this year. The last two are very significant because the two holidays they fall on represent events on earth that have not yet been fulfilled. I’ll write more about this in another post later this week. Sign 2: A full solar eclipse will be visible from Israel on September 20, 2015. The total solar eclipse on March 20th falls on Nisan 1, which is the first day of the first month of the Biblical calendar. According to Jewish tradition, a solar eclipse on Nisan 1 is a sign of judgment. And this has certainly been true in the past. For example, there was a solar eclipse on Nisan 1 in 70 AD. Later that year, the Romans, using largely Arab forces, attacked Jerusalem and completely destroyed the Temple. For more information about the coming solar eclipse and its possible implications see: http://www.prophecynewswatch.com/2015/March20/201.html. Sign 3: September 20th is also the anniversary of the dedication of the second Temple to the Lord. Sign 4: The last of the blood moons coincides with the start of the the seven-year Shemitah cycle. The year following the destruction of the second Holy Temple was the first year of a seven-year Sabbatical cycle. In the Jewish calendar, counting from Creation, this was the year 3829, 68–69 CE on the secular calendar. By counting sevens from then, we see that the next Shemittah year will be the year 5775 after Creation, which runs from Sept. 25, 2014, through Sept. 13, 2015. Will Christians Be Gathered This Year? I’m not a date-setter but the coincidence of heavenly signs this year has caught my attention. These signs are highly significant. With Nisan 1 indicating judgement of the nations, along with the rest of the signs, this could mark the beginning of the period of judgement we read about in the books of Revelation, Daniel and others. I’m not advising people to go and sell everything they have because the Lord is returning this September for us, because there is so much we don’t know about God’s schedule of things to come. But something is brewing! Something big is about to happen and I can’t wait to see what it is. But I’ll have to. Wait that is. James 5:7,8 Be patient, then, brothers and sisters, until the Lord’s coming. See how the farmer waits for the land to yield its valuable crop, patiently waiting for the autumn and spring rains. Titus 2:11-14 For the grace of God that brings salvation has appeared to all men. It teaches us to say ‘No’ to ungodliness and worldly passions, and to live self-controlled, upright and godly lives in this present age, while we wait for the blessed hope—the glorious appearing of our great God and Savior, Jesus Christ, who gave Himself for us to redeem us from all wickedness and to purify for Himself a people that are His very own, eager to do what is good. He’s coming back people! Get ready if you’re not! Get busy telling others about Jesus Christ if you are! Things will be brought to completion by Him who knows the end from the beginning.